The statistic presents a ranking of the most overpaid actors in Hollywood in 2018. 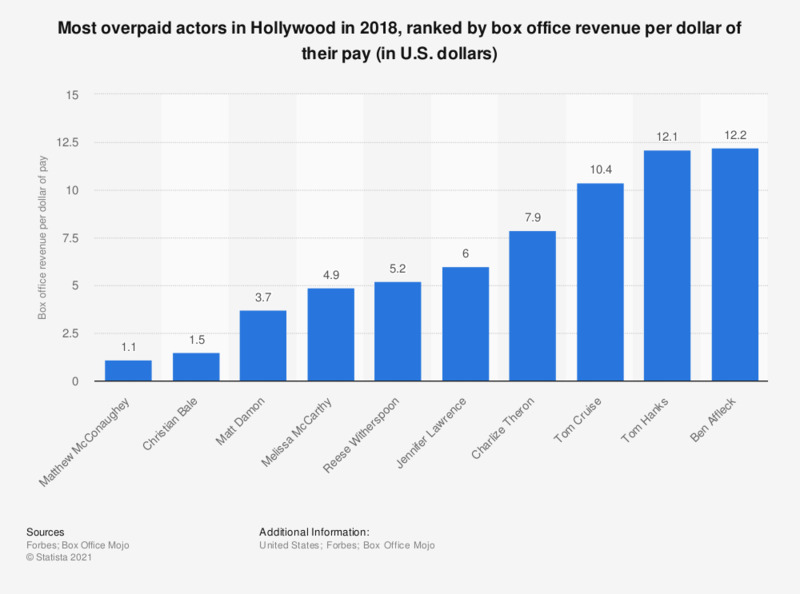 Matthew McConaughey ranked first on the list - his most recent movies generated on average 1.1 dollars of box office revenue for every dollar of his pay. Christian Bale ranked second with 1.5 dollars per a dollar of his pay. The figures are based on "the last three Hollywood films each actor played a major role in. Only live-action movies released on more than 2,000 screens before June 1, 2018 were considered. Actors who had not starred in a new eligible movie since last year’s scoring period were ineligible. A limited definition of movie operating income is calculated by deducting budget from worldwide box office. Operating income from the star’s three most recent significant movies is then divided by the actor’s estimated pay for those films."